God says that He is new every morning. His creation continually declares the variety of His innovative power and His kingdom. As His children we are to do the same -- after all we have the ability to hear Him. Eighty times Jesus talked about the Kingdom of God; only two times did He talk about the Church. He loves the Church and died for it, but He really wants us to understand the Kingdom of God. A kingdom is not a common concept for most of us today. A kingdom is simply a place where a King rules -- it is the realm of his influence, where his values, laws and enforcement are in operation. When we have relationship with God, we start to understand His Kingdom, we begin to know our Heavenly Father’s heart and know His ways to demonstrate His heart, values, principles, character, and love to the world. The challenge is how do we do this in a modern secular society -- how do we make the Kingdom of God relevant to mankind in this century. Recently I was impressed by several examples of how God’s children have been bringing the Kingdom of God to others in their societies. A local church in a small town in Northern Ontario had been asking for the right to have open air meetings in a local park for quite some time but had been denied a license by city council. This same town conducted a festival each year that for the most part focuses around a beer tent. The Pastor asked city council what did they plan to do for the children when the parents were in the tent. They city had no plans for the kids. The church offered to run a program for the children in a local park. Initially the town was very skeptical of the church but granted them to have a small portion of the park. The church sold hot dogs for a quarter and conducted games for the kids and it was great success. The next year the town council said the church could have the whole park and they could do whatever they wanted. The afternoon of the event came, kids had their faces painted, a contemporary worship band played kids songs, there were puppet plays and games. Over 300 people came to the park. This was the first time in the entire history of the town that contemporary worship had been declared over the community. The kingdom key that this church used to unlock the community was: In a spirit of generosity and love they were servant of all. Recently a worship band was asked to play at the reception of a non-believer's wedding. The worship team played old rock and roll, like ”Johnnie B Good” and “Under the Boardwalk” as well as some Christian songs. During the practice the owner of the house (who is not a believer) overheard the band and for reasons he did not understand, he began to cry. He told his wife that it was the most beautiful music he had ever heard. It seems that God can penetrate the heart of a person even if the worshippers are singing so-called worldly songs. The kingdom key that this band used to unlock the heart of this man: They gave freely of their God-given talents and were servant of all. Through social media a person coordinated a flash worship dance and singing that occurred in downtown Toronto in a main square of the city. They taught people the choreography using social media and at a specific time, two people stood in the middle of the square, one had a guitar, the other just sang. They were joined together by hundreds who had all planned to be there and began to worship, dance, flag and play other instruments. For six minutes the city square was filled with worship and the declaring of the glory of God. The city people saw believers unashamed of the Gospel, not fighting with each other, but in one accord abandoned in worship. The kingdom key these people used to unlock this city: Unabashed, unashamed public worship in unity. In Canada in the winter we have a holiday called Family Day. It is designed to give everyone an opportunity to have a day off with their families to enjoy the winter. For the last two years a local church has rented a large hall and filled it with bouncy castles and other inflatable rides. They have face painting, music, puppets and all kinds of kid-related events. They also have an Open Heavens Café, where people can have their dreams interpreted and have life readings (which are just prophetic words) at no charge. The café and the event have been a big hit. The kingdom key this church has used here was: God knows the intents of the heart and they are not afraid to ask God for words of knowledge to unlock the belief, healing, and kingdom identity in the hearts of men and women. At Communion with God Ministries we would like to facilitate a collection of the many creative ways that God’s people are bringing the Kingdom of God to their communities. Our goal is to inspire you with new thoughts and approaches on how to step out as individuals and represent God’s character and love though our actions to our communities. To accomplish this goal please use the "comment" link to this blog, and share with us all examples of how you have seen people or yourself bring the kingdom of God to society and these stories will be a source of inspiration to others. Thank you! George Washington Carver was certainly one who released Divine creativity. The article below was written by William J. Federer and can be found here. 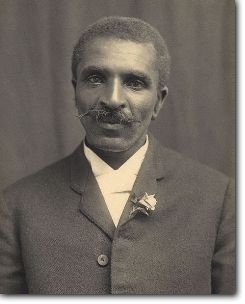 Born a slave around JULY 12, 1864, George Washington Carver became a scientist of international renown. On January 21, 1921, Carver addressed the United States House Ways and Means Committee on behalf of the United Peanut Growers Association on the use of peanuts to improve Southern economy. Initially given ten minutes to speak, the committee was so captivated, his time was extended. “What book?” asked the Chairman. Submitted by Anonymous on August 9, 2012 - 11:24. This summer our small church set up an outdoor event in a soccer field. We made flyers and walked the community handing out the flyers and talking with strangers one-on-one about the event. We also did some posting on facebook on an event page. Bill and Sue Dupley came with a small band and played some easy listening rock-n-roll all afternoon while people visited tables that were set up to look up the meaning of their names along with a team that took that meaning and prophecied into them. Everyone loved that and who wouldn't love a word that built you up, edified you and made you feel like a special creation of God! Another table had face painting, and free bibles. We also had free bottles of bubbles that we handed out. It was fun to see a soccer field of floating bubbles. The bubbles were enjoyed buy the children and the adults alike. Sue Dupley had a very large bubble hoop and would attempt to incase a small child inside a large bubble while prophecying to the child. Many gathered around to watch! Our church purchased hot dogs and buns and BBQ'd all afternoon,offering the community free bottles of water, free hot dogs, free bubbles, free bibles and a lot of free fun. This was our first event and we are planning more in the future. We had great feedback from the church and the people who attended. It didn't cost a lot, it was fun and the people who came loved it. Later in the day we turned the easy-listening rock-n-roll to worship and you could feel the tangable presence of the Lord fall. Many were worshipping with flags in the soccer feild as others entered in and some watched in awe We are now working on some follow up with some of the people who showed up for the event. One lady wants to know if she can come teach us Line-Dancing. :) (It's an inroad) Evangelism was never this light and easy! Don't format and box what outreach and evangelism has to look like and you will be amazed at the results! God can't fit in a box He is too big! Submitted by Anonymous on July 26, 2012 - 17:07. I am hoping that you will be elaborating more on this issue. I like a little more information.